With a satisfying nod to their 2014 selves, the guys expand their connective universe and show how self-love pushes them further. One of the lesser explored but crucial aspects about being a member of BTS' A.R.M.Y. is the connective, ever-expanding through line in the Korean group's discography. With the release of Map of the Soul: Persona, the septet further proves they haven't forgotten who they were in their early days even as they aim to be bigger, better versions of themselves today. From the release of the "comeback trailer" to introduce the EP's "Intro : Persona," fans instantly recognized something familiar: Sonic touches of a now-five-year-old "Intro: Skool Luv Affair" track which opened their Skool Luv Affair EP from February 2014. New single "Boy With Luv" continued this theme as the matured answer to Skool's lead single "Boy in Luv," significantly fusing it to the past if for its use of "luv" as opposed to past BTS songs and albums that used "love" in their titles. In 2014, BTS declared their emotions and displayed a willingness to dive headfirst into love while exploring the hardships of unrequited feelings. Now, the guys have a wider viewpoint. "Intro : Persona" sees BTS leader RM exploring his identity and deeper emotions (like the darker aspects of his personality such as his tendency to detach) while "Boy With Luv" sees the full band finally swimming in self-love and discovering inspiration within themselves. Now, BTS are able to healthily share and express that with a special someone – it could be a text from a beau or the fans they draw themselves closer to as their spotlight grows brighter. Meanwhile, Persona cut "Jamais Vu," performed by the trio of members Jin, J-Hope and Jungkook, details the phenomenon of doing something familiar which suddenly feels foreign — basically, the opposite of déjà vu. Forgetting and loss of memory has been a longtime concept in the BTS Universe (most recently seen in the BTS webtoon Save Me where Jin — who opens the track saying he's lost again — relives the same day over and over). But Map of the Soul: Persona is hardly a throwback. Particularly, "Boy With Luv" feels like BTS making a conscious effort to expand their reach and sound with a pop-leaning single featuring Halsey. While their last single "Idol" included a seemingly savvy remix with Nicki Minaj, the move felt a little disjointed when the Queen MC only dropped in for a verse and wasn't actually able to film a music video with the band. Having Halsey on board — a longtime BTS fan and friend — feels more organic in bringing female vocals to blend and respond to BTS lyrics, only upped by her cute, K-pop-esque adlibs. All the better: Halsey earned her first solo No. 1 on the Hot 100 this year thanks to "Without Me," helping the act gain an additional edge over Streets Talkin's main singles chart where they've peaked at No. 10 to date. Plus, radio is finally biting the BTS bullet as the guys went to Z100 and SiriusXM this morning for interviews — they've only hit as high as No. 25 on the Mainstream Top 40 pop songs chart where "MIC Drop" peaked in 2018. The septet's growing appreciation and admiration for life is further heard through the various album cuts. These sentiments are felt in the lush and effervescent "Mikrokosmos" (a title that plays off the word "microcosms" as they explore the idea of each human living peacefully alongside one another in his own little universe), the Ed Sheeran-assisted "Make It Right" (where they consider how they make the world better through their platform with simple human connection and kindness) and the affectionate dedication to A.R.M.Y. titled "Home" (where BTS say reaching their global fanbase makes them feel safe and comfortable no matter where they are). There's also undeniable hope amid the lost feelings of "Jamais Vu" where the guys promise that they won't give up. Perhaps in the most curious artistic choice in the track list, Persona's closing track "Dionysus" seems to be a sonic throwback to BTS' early years with a production similar to their early penchant for '80s-inspired rock/hip-hop sounds (not unlike Run-D.M.C.) such as "Boy in Luv." "Dionysus" (named after the Greek god of wine) sees BTS coming through with that unfiltered attitude of previous years, but this time around they're discussing their creative processes and artistry rather than an obsessive crush. Calling this track "Dionysus" could be a timestamp to note the band is older (when "Boy in Luv" was released several members were not of drinking age) or could note several of the Greek god's other identities (he has several aliases as the masked god, including the god of theater, the god of liberation and the effeminate or androgynous god). Ending with "Dionysus" could indicate that the guys are moving forward toward their future and removing whatever they held back from their previous identities. They have found themselves and now have the confidence to move forward fearlessly and more capably than ever. They're boys filled with love (or "Luv") and know they have love no matter where they go in the world ("Home"), but they're still looking to make greater change and impact ("Make It Right"). 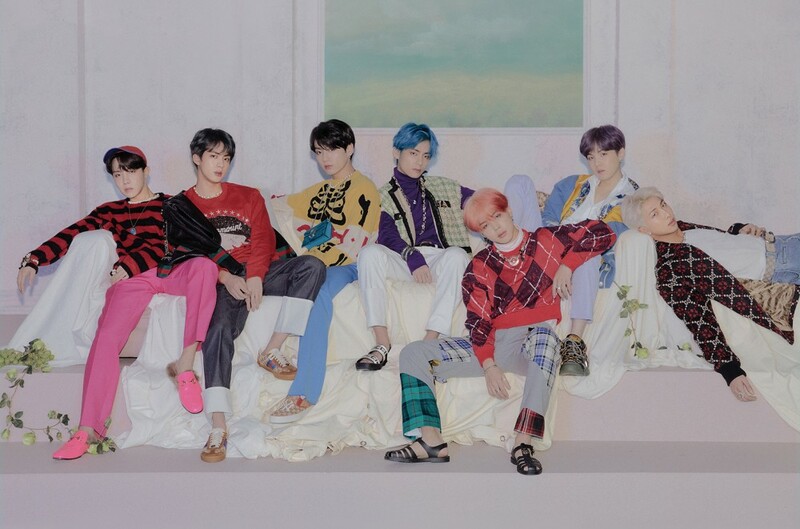 Map of the Soul: Persona was said to introduce BTS' next chapter and these seven songs feel like they're leading to grander things from RM, Jin, Suga, J-Hope, Jimin, V and Jungkook. How grand? We'll have to wait for the next chapter, but all signs point to BTS — once again — going where no idols have gone before, with their universe only expanding with every release.